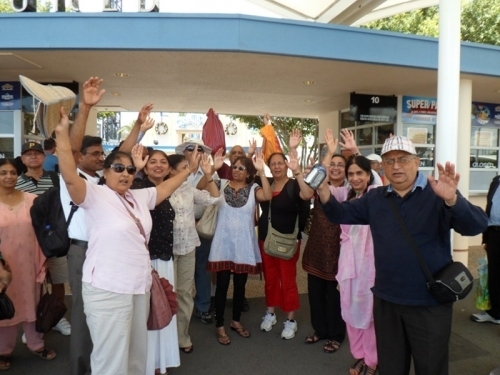 We are one of the largest Asian tour operators in UK. No one understands holidays as better as SONA TOURS. It's what we do better than anyone else. With us you are guaranteed top VALUE accommodation, finest Indian food and the very best services. We had a great time and the guide were very good. The overall tour was enjoyable and. The staff were very supportive especially the tour manager Mr. Dhruv was great. Mr Nishant Mehta and Andree the driver were excellent. Mr Mehta went out of his way to arrange optional tours to Vatican Museums and Sistine Chapel for us and we were extremely grateful for this. I had a good experience on the cruise. His constant humour kept us in good spirits !!!! Our Manager Kamlesh was simply the best. His constant humour kept us in good spirits throughout the trip. He ensured that there was never a dull moment in the entire trip. The best coach tour I have had till date. Our coach driver Mike was very cautious and ensured we had a safe journey across the four days. Lovely and patient team, i will recommend everybody to join you ! Scotland is very s&ccedil;enic,clean,beautiful and people are very friendly.It has lot of history.I felt like moving to Scotland for good. We had wonderful time very friendly group Nickesh is one of the best guidance we had hotels was very good like Indian food.over all we had good time see you next. I had a amazing quality time with my father. Nishant was an excellent as a guide and helped us where required beyond his responsibilities. Nature was amazing. Glacier rides were good. River safari was disappointing but we can't order bears to come out . So no complaints. Hope to visit other countries with you if possible. Overall it was an excellent tour, Nijesh was an excellent tour manager, he was able to manage some very difficult ad demanding guests. The hotels were good, in good/excellent locations. The only improvement i can suggest is you could try to improve on some of the restaurants providing Indian food; it may be difficult in Japan but they could try to improve the quality, they don't need to provide 2/3 curries, one of a better quality would be fine. Well organized trip. Nothing was too much trouble for Chetanbhai our tour guide. He was full of information of the areas visited and also wider areas. First Trip with Sona Tours. Well Organised and excellent manager/guide service by Chetanbhai helped all the way! Well organised trip. Nothing was too much trouble for Chetanbhai our tour guide. He was full of information of the areas visited and also wider areas. Really enjoyed, very well organized. This was the second tour with Sona Tours and I was not disappointed. This tour was really great and would recommend this to everybody. The tour manager was good and handled the tour very well. The walking tour organized was really good. But I feel that the visit to Pompie should also be planned with a local tour guide. Further, Vatican city should also be included. Overall the trip was excellent and enjoyed every moment. Overall exciting and interesting tour. Well conducted by all your staff. Have made some recommendations for improvement. On the whole very enjoyable trip. Fabulous tour. Can't praise the tour guide enough. Nishant Mehta did an outstanding job looking after our group. We enjoyed throughly and the tour was organised very well. This was our first experience with Sona Tours and I would recommend them strongly. Very good guided tour, excellent explanation by guide, on all places visited. We thoroughly enjoyed the tour, the Drive, his assistant and the Guide were all excellent. The Guide, Mr. Priyantha Balakrishan, was very helpful, and took care of all our needs. I would like to say we all had a very nice time on our tour to Alaska. Thank you for providing us with an excellent service, especially our tour guide Nishant Mehta who was very polite and was a pleasure to be around all the time. We will always remember him for making our holiday as relaxing and comfortable as possible, we would definitely recommend him for future tours. Overall, we had a fantastic time. The guides were excellent and were always waiting for us at the airports and hotels at the time specified. Their knowledge of the area was superb. All the hotels were very pleasant and in good decorative order though in one or two, the vegetarian choice could be better. The itinerary went to clockwork and all entrances were paid for in advance so it was very clear what extras we needed to pay for. Would highly recommend Sona Tours. Overall an excellent experience. Good organisation and sight seeing. Excellent hotels. Good and safe drivers. Vegetarian meals overall good but had some problems. Good trip. Leave out the meals & let us choose a la carte & pay for it ourselves, as South Africa has no language barriers. Great company, a very accommodating, efficient and cheerful tour guide made us really enjoy the trip. thw tour was amazing and wonderful. your staff are very profwssional especially guide Mr. Kamaleshbhai and driver Mr. Subash were friendly and highly knowledable of the location and topography. food and hotel accommodation are good. thanks and very much appreciate. Will tell this to my friends! I would recommend Sona tours to friends & relatives. good tour made great by the members of the family who were part of this and also special mention the Nishanth and Paul who were both very professional and courteous throughout. Nishanth in particular was very good and made our journey enjoyable. Extremely great service provided by Sona Tours right from the start from booking our Gem of Holland trip to meeting our rep and coach driver on arrival - to travel itinerary, excursions, hotels, breakfast, dinner (excellent choice all round). Really enjoyed the whole experience and can not wait to book our next trip with them. Loved every bit of the tour. Our guide was very good and knowledgeable. it was lovely,fellow travellers were good,don't mind doing another short trip. Very nicely designed tour. Covered all good places. Tour Manager K Patel was very friendly. Hotels and food was very nice. Overall, would love to plan another tour with Sona Tours. Keep up the good work..
To be with unknown persons for 26 days and become acquainted and friends over that period with different age people from whom one learnt a lot, people's different expectations .The overall experience was very good. Ronnie wasn't just a tour manager but was also a good entertainer and joined the group on breakfast and dinner tables making us feel he was part of the group rather then a tour manager.In the group there were a number of people who could entertain be it with morining prayers on the coach, bollywood songs, jokes etc. Overall we enjoyed the trip.The local coach drivers and guides were very knowledgeable and gave us a running commentary. Very good experience, friendly tour driver/ guide. Very well structured trip given the short notice. I believe the overall experience was very good however I would personally say that the locations and restaurants provided were poor I understand you can not eat within Paris and expect to pay what we did however I would happily pay more if the rest taunts were better as it's a crucial part of the package you are offering people are likely to appreciate a nice restaurant. Even if your prices are considerably higher than other tour companies having a better food service would work in your favour and could attract more business. The tour guide were absolutely brilliant and had a great laugh. Hats off to the bus drivers they work very hard and are always welcoming and friendly. A memorable and environmental oriented trip. It was a good experience going around Scotland with Sami. Time was adequate and the accommodation was good. Very nice trip well coordinated by our tour guide Sami. He ensured to cover not only the places as per itinerary but also many more. Overall great experience!